The PlayStation Classic is going to be released on December 3rd, exactly 24 years since the original PlayStation was released in Japan. And they finally released the full lineup of games. Many are fan favorites, though some big names are missing, and many fans can point out their own favorites that may not have been added. Some of these games have already been remastered, so some may already own them. Below is the list of games that will be found in the upcoming release. 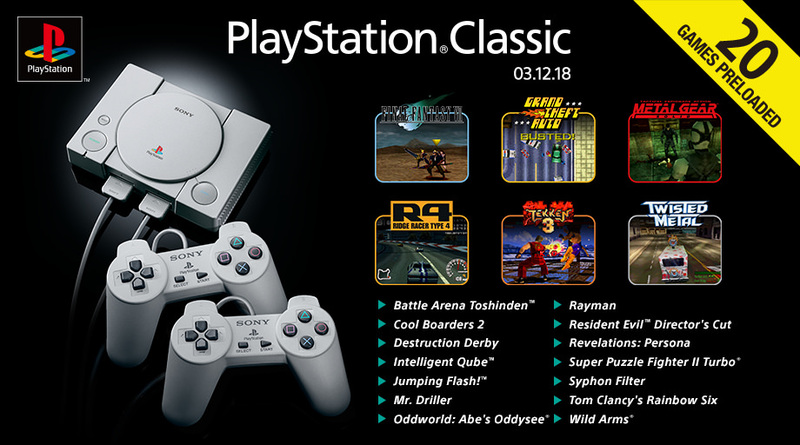 We’re really excited to play Syphon Filter, Rayman, Oddworld: Abe’s Oddysee, and Battle Arena Toshinden. But one of our favorite games is not there, and that is Crash Bandicoot. The trilogy was just released, so that is understandable that it is not on there. Will you be getting the PlayStation Classic? Did the list finally convince you to get one or did it leave you wanting more? Let us know. The post PlayStation Classic games announced appeared first on Nerd Reactor.